Our nougat kitchens are located in a historical house, where the bishops from Marseille used to come to spend their summer. 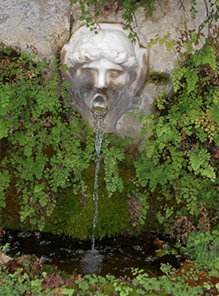 The huge stairwell decorated with sculpted crosses, the corridors with gothic vaulting and the fountain with an angel head are witnesses of this past period. The soft scent of honey rises from every stone and perfume, this century old place. Since 1864, four generations have lived here and have passed on the secret recipes of our black and white nougats. The original copper cauldrons and mixing containers are still used to make our nougats every year. To respect the Christmas tradition our institution makes nougat only from September 15 to the end of December every year using a method of fabrication that hasn’t changed since the origin of the kitchens. We like to say that nougat has to be a transient sweet that only last for Christmas holidays leaving the eaters with their desire until the next fall. This particular rhythm of fabrication is not only motivated by the tradition of Christmas but also in respect to the old recipe (since 1730). The recipe for white nougat recommends mixing honey of lavenders and honey of all flowers, equal volume of honey and almonds and a little bit of sugar. Full of flavor, this nougat is sweet and soft and is difficult to cook, preserve and store during the hot summer time. Here, tradition and quality have a price; the cost is to stop making nougat in January to start again in September. 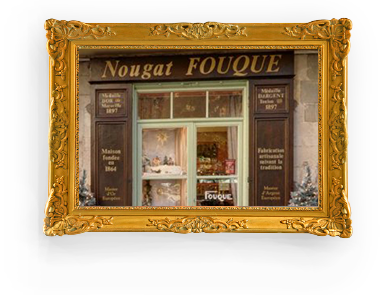 Open with us the door of our shop and discover the fantastic word of nougat. In our laboratory you’ll see how for hours we are making our different kinds of nougat. In the next room where we cut the nougat you will taste the freshly made nougat. 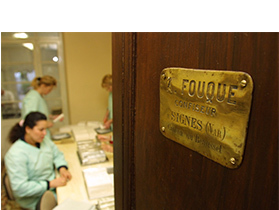 We will then move into the place where our hand skilled persons wrap and pack the nougat. It is always with a great pleasure that we open our kitchens for you and show you how we make our nougat. The kitchens are located in the back of the shop and open from September 15 to November 15 at à 9h30, 14h30 and 15h. Please call us or send an email in advance before planning to visit the kitchens. The visit is free and guided by the artisans themselves. Groups are welcome but limited to 12 at a time (larger groups must be split). Meanwhile you can take the virtual tour of our kitchens.